Two or three months ago I was contacted by Andreas Eberhard, a journalist on Braunschweiger Zeitung, the Brunswick local newspaper, who had come across the Twitter page for The Brunswick Printers. We e-mailed, had a phone conversation, and then spent most of a morning on Skype. He was hugely and very genuinely interested in the story, and it was a strange and poignant experience to be talking to him in this way and in effect taking the story back home. Over the summer he has been working on the story, and we have had occasional e mail correspondence, and he’d given me a rough idea of when it might be published; but today my phone started pinging with e mail alerts and there were about alf a dozen orders for books and an enquiry from a bookshop, all in Brunswick or nearby, so I knew it had been published. He has sent me an image of the full page article and he is sending me a print version over. So many coincidences, twists of fate and links and connections have made this story possible, and it is another one that caused Andreas to find and click on The Brunswick Printers Twitter page and take the narrative further and to return it to where it started. It’s touching for me, and I’m sure my father would have been moved by the interest that it has sparked. I find it particularly resonant that at this time in history when Britain is following its own extraordinarily rash and ill-considered route with regards to Europe, the narrative of The Brunswick Printers leads us back to the turmoil out of which European unity was envisioned and created. With thanks to Andreas Eberhard for his interest and commitment; and yes, I have yet to have it translated from the German. When I do I will post the translation up on here. Article written for the September issue of Forum, the journal of The Letter Exchange. Much of this content appears in fragments elsewhere on this site, but it was an opportunity to write a brief precis of how the maps came about in one piece. In the two houses my parents lived in during my lifetime there hung, quite modestly on a landing or in a corridor, a small map and it’s reverse printing plate, sharing a frame. In a desk drawer lay some frayed, manilla envelopes containing maps, documents and photographs. When my parents died, the framed map and plate, and the manilla envelopes, came to me and lay in the same drawer to be infrequently bought out at the request of my children or of friends. My father, Philip Radcliffe-Evans was born in Roby, near Liverpool in 1917, the youngest of three children. He was educated, not very happily, at Shrewsbury School, enrolled at the London School of Printing in about 1935 and had travelled to China on a merchant ship by the time he and his brother enlisted in the Royal Artillery in 1939, and at 21 he was a captain in command of a gun battery in N. Africa. Philip Radcliffe-Evans on the right. Of his time at the London School of Printing he wrote: “It was clear that the Depression had left the school starved of investment for re-equipment and the school was at least equally well equipped to teach the methods of the 1890’s as the 1930’s. I fear that this state of affairs suited my inclination exactly… The litho plant was admirably suited to this mentality. As I remember there were only 3 or 4 presses capable of accepting the new-fangled metal plates whereas there was a long row of stone transfer presses and an abundant supply of stones. It is no exaggeration to say that I used most of my time here…” These circumstances must have been crucial to his resourcefulness and inventiveness in Oflag 79 almost a decade later in 1944. Like many of his generation, he spoke little of the war. In 1941 his older brother was killed, and the following year my father was captured by Italian forces at Tobruk, Libya. He and many other Allied troops were taken first to Chieti in Italy where they were held before being moved first to Stalag VII-A, Moosburg, Bavaria then Oflag-VIIIF, Mahrisch-Trubeau and finally to Oflag-79, Brunswick. Oflag79 POW camp in 1945. A Former German paratroop barracks. In August 1944 the Brunswick POW camp was hit by bombing from the Allied Air Forces. There were casualties and the kitchen and shower blocks were hit, damaged and partly destroyed. – “Late in August we had the big raid which was one of the most horrifying experiences I have had. Wave after wave of bombers came over dropping HE (high explosive) & anti-personnel bombs… three people were killed including poor old Kilkelly”. The prisoners were forced to use composite tiles from the shower blocks as plates to eat off. “While washing them I noticed that the grease left a pattern on the stone and, wondering at this familiar phenomenon, I tried grinding two tiles together – with sand and water between them. I became more than casually interested in them when I saw that the grease had actually been absorbed into the stone and a definite image had been formed. (This is the principle of lithographic printing)”. He experimented with the stone tiles and margarine mixed with carbon for ink, and established that he could print and quickly saw how the process could be applied; – “One of the prime needs of an escape is a map, and hitherto these had been laboriously traced and (hand)copied by a dedicated number of cartographers. The originals printed on silk and designed to be concealed ‘about the person’ had been issued to certain personnel in England and a few had reached our camp in Brunswick. Apart from the increasing number of people wanting to “have a go” there was also growing concerns as to the possibility of the Russians arriving at Brunswick before the Allies, and the even nastier, and apparently not unfounded rumour, that the Gestapo were thinking of moving all POWs Eastwards. In either case plans for a mass breakout were being formulated”. So he had stumbled upon a response to a need at a time of growing urgency. My father was a printer by trade, not a map maker or cartographer, and so what notes and information I have of his refer almost entirely to the technical problems of building a press from scratch, making inks and maintaining secrecy, though there is a reference to his being given access to two cartographers (fellow POWs) through the “escape committee”. There were 4 different maps produced, 1200 in all, so it was a press with a purpose and was a mass production process. They are all printed on thin, utility paper, stolen from German admin offices, and are all roughly similar in size, varying from 280mm x 220mm to 220mm x 190mm. After much practical experimentation in the Autumn of 1944, processing and inks utilised crushed leads of indelible pencils, bitumen scraped from the joints between floor tiles, fountain pen inks, Chiver’s jelly, powder paint, molten margarine and and small quantities of acid obtained illicitly from medical supplies. The machine was constructed from floor boards, packing case parts, window bars, leather from an old flying jacket and parts of a simple book binding press obtained via the Red Cross, supposedly for the maintenance of books in the camp library, also sent in supply parcels. My father and fellow printer, Ken Whitworth, trained six other prisoners and ran two shifts of four men each, producing up to 60 maps an hour. The maps were made to three different scales; the largest scale map is of Oflag-79 camp and its perimeter at 1:10,000; 100 were printed and it is the largest in actual size – “Much of the information on which this had been based came from a local map obtained by our “fixer:”, but a good deal had been observed by temporary, and, as far as I know, unobserved escapees who had been out on reconnaissance”. It has a grid lettered on vertical and horizontal axes and numeral coordinates within each square and has a short text notation. In three colours it shows the camp in relation to the Magdeburg – Hanover railway line to the North, the River Schunter to the South and its relationship to the village of Querum. It is easily possible to find the exact location of what was Oflag-79 by comparing this map to Google maps and Google Earth. 1:10,000 three colour map of Oflag79 and immediate surroundings with an overlay onto Google Earth. I had thought that the camp was demolished at some point soon after the war, but in correspondence with Andreas Eberhard of the local Braunschweiger-Zeitung newspaper he has said that “Oflag 79 was sort of rediscovered by local historians in Braunschweig only a few years ago. For many years it was almost forgotten in the public memory of our town. From 2010 on, some research was done. Now there is a book and several newspaper articles about the camp”. It is currently used to house refugees (2017). The next largest scale map is a 1:100,000 three colour map of the Brunswick area. It is 230mm x 200mm in size, 100 were printed. It is gridded into six principle squares with numerical coordinates along the top and down the right hand side. Along the bottom it has a scale and a simple key with principle features; rivers, canals, woods, railway lines, windmills, autobahns, main and minor roads. Oflag-79 is central, just NNE of Braunschweig. This would have been copied from one of the clandestine maps that came into the camp, often printed on silk and hidden in the cover of a book or Monopoly board; ones which previously would have been copied laboriously by hand one at a time. 1:100,000 three colour map of Braunschweig and routes North. The northern map of this pair, with similar notation, covers Luneburg and the ports of Hamburg and Bremen with the sea and estuaries depicted in a shade of blue that is still beautifully vivid 70 years on. 1:1,000,000 maps with southern and northern sections enabling escapes to be made to the North coast ports Hamburg and Bremen. 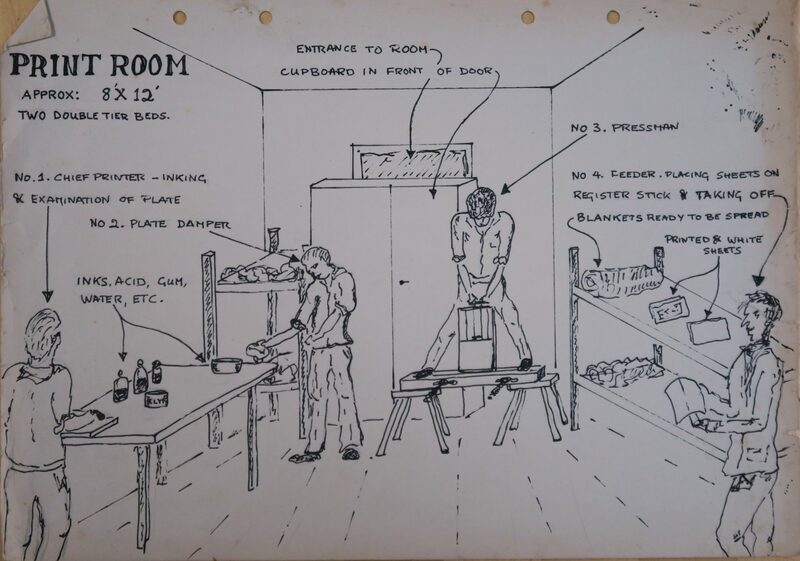 On 30th January 1945 my father and another prisoner were caught working on a printing plate, the press was destroyed, as were a number of completed maps, and they were sentenced to solitary confinement and limited rations. Oflag-79 was liberated on 12th April 1945. People often ask how many were used and with what success. More than 70 years later it is impossible to say, though I am in touch with the family of another prisoner involved in the press, Wallis Heath, who still have copies of the maps. My father wrote in around 1950 “I would like to be able to claim that our maps were responsible for escapees getting home, and I’m sure that they did but there are no statistics. Certainly they were issued to those who were allowed to try between January and April 1945 and it is really sad that we had not discovered the possibilities of the process a little earlier”. In 2014, I met, completely by chance, Ken Burnley, who had been an apprentice in my father’s printing firm, Tinlings of Liverpool, in the 1960’s. Ken is now retired and runs a letterpress studio in Liverpool, teaching letterpress and producing limited editions. He remembered my father both well and fondly. I told him about the maps, of which he was unaware, and he asked me to bring them next time we met. We laid everything out on the table and after a minute he said “We have to do a letterpress book about this!” – and so The Brunswick Prison Camp Map Printers came about. The Brunswick maps are an extraordinary technical achievement, wonderful objects, and form a small part of both WW11 and printing history. The excerpts here come from my father’s POW diary, an article he wrote for Printing Review in 1951 and type-written notes for a talk he gave around the same time. In their entirety, these, with other archive material in my possession, have the basis for a more comprehensive publication in the future. Mark R. Evans. August 2017. Extracts from Philip Radcliffe-Evans notes, POW diary and Printing Review article 1951. As springtime turns slowly to Autumn… update. Part of my father’s wartime diary, and a drawing of my father in Oflag 79 by a fellow POW (unknown). Work and life and summer have crept in like weeds in a garden over the last couple of months. But on the Brunswick Map Printers front, small packages continue to be packed and sent off to various corners of the globe. Quite a number to the USA, a few to the continent and most to the UK. About half the numbered letter press limited edition of 150 have now gone, printed on the machine that appears in this slide show. The digital facsimile edition of an initial run of 300 are going out more slowly, but in a red cover with the same format and the same care taken over appearance and presentation they are lovely items to have and to hold; and to read. Currently there is an 1800 word article on the Brunswick Printers in Forum, the twice yearly journal devoted to lettering, font and typography and the voice of http://www.letterexchange.org. As a result of this I’ve been asked to write a similar piece for The Quarterly, the journal of the British Association of Paper Historians with more emphasis on, and illustrations of, the paper used, not only for the maps, but also for the letters, documents and other archive material relating to the Brunswick Printers. I have also been contacted by Kirsty Smith, who is the daughter of Wallis Heath who was one of the fellow POWs who was involved with the Brunswick Printers and who was one of the team involved in producing the maps once the processes had been established. I have access to, and her permission to use, a carbon copy of his wartime diary which is probably the only other account of the Brunswick Printers in existence. Where my father has written most about the development and construction of the press itself, the lithographic process and the drawing of the maps, Wallis Heath has written in much more detail about how the inks and colours were made. I plan to transcribe the relevant sections of his diary this Autumn and see if I can construct a documentary narrative using both sources. If there is anyone with contacts with journals, radio and media outlets etc which might be interested in the Brunswick Printers, contact me, Mark Evans, at https://thebrunswickprinters.com contact page. Many thanks. London School of Printing > London College of Communication. A few months ago I contacted London College of Communication about the Brunswick Map Printers……. LCC is what the London School of Printing has evolved into, and the London School of Printing is where my father learned his trade and particularly printing off litho stones in the mid 1930s. These were the skills that made the map printing operation in Oflag-79 possible in late 1944. My father, Philip Radcliffe-Evans,Kelly Thomas at London School of Printing on the right looking dashing with cigarette in mouth. When I contacted LCC, I was put in touch with Kelly Thomas, Project Co-ordinator, who was immediately interested in the connection between LCC and the Brunswick Map Printers and my father as an alumni of the old London School of Printing, and she asked me to write a piece for the college’s blog. LCC posted the piece yesterday and the link is HERE. Among the new material I have found among various boxes and folders I have had in my possession since my father’s death in 1992, (and through several house moves via a number of attics, cupboards and shelves), is a much longer typewritten transcript than the Printing Review article of a talk my father gave about the Brunswick Printers in about 1949-50 containing much more technical information. Further to that I have an original copy of a typewritten war diary of a man called Wallis Heath living in St. Andrews, Fife with whom I had a correspondence in the mid 1990s. He had also been captured at Tobruk, and had had a parallel journey through various camps to my father, from Chieti in Italy to Oflag-79 at Brunswick. I believe he has now died, but he was kind enough to pass on 40+ type written sheets of his diary to me. He had printing experience before the war, and though there is no mention of it in his diary, he told me that he had been involved in the map printing press at Brunswick, and though there is no mention of him either in my father’s diaries, he wrote an article which appeared in The Times in 1997 with more than enough technical information that is corroborated by other sources for me to be certain that he was one of the team involved with my father and Ken Whitworth who is mentioned in both my father’s and Wallis Heath’s diaries. Only one page of Wallis Heath’s notes relates to the Brunswick Printers but it is particularly interesting on the precise detail he briefly records about how the inks and wash-outs were made and how the press worked; used in conjunction with the detailed drawings of my father’s (which can be viewed in other posts on this site) it would seem to be entirely possible to reconstruct a working facsimile of the press… an interesting project about which Ken Burnley and I have had brief initial conversations. Here below is the page from Wallis Heath’s notes referring to the press, inks, etch, wash-outs and process. Part of the one stone tile printing plate that survives; bought back in a goat-skin German WW1 dispatch rider’s bag by my father in 1945. After a lull in wrapping up books and taking them to the Post Office round the corner there has been another flurry of interest……. several to London, one to Eire and one to California this week. But interest comes in different forms and I am busy writing pieces for various journals, blogs and magazines. There’s an illustrated article appearing in Maplines, the journal of The British Cartographic Society in August which has been sent. This weekend I’ll be sending a piece to the London College of Communication which is what the London School of Printing that my father attended in the late 1930s is now called and incorporated into – I believe this will be appearing on their blog shortly. And I’m about to start a 2000 word article on The Brunswick Map Printers for Forum, the twice yearly journal for The Letter Exchange, an association for the people involved in the lettering arts, typography and book design. This will appear in the Autumn. These make for valuable opportunities to revisit, update and become further acquainted with the Brunswick Printers’ material, story, process and the secondary story of how this book came about. It also offers time to consider whether to take it further, and if so how. I have recently found further material of my fathers consisting of 12 closely typed pages he wrote for a talk that he must have given to perhaps The Printing Historical Society is about 1949-50-51. This is longer and much denser and richer on technical detail and process than the Printing Review article we have re-printed in The Brunswick Prison Camp Map Printers and may well be of interest to the letterpress and print community. I am about to start transcribing it into digital form as a start, and then decide if it is worth publishing in some form. I am also due to speak with Andreas Eberhard of Braunschweiger Zeitung next week, which I am looking forward to. It seems curiously poignant and meaningful to be able to take this story back to where it started in such different circumstances, long after my father’s death in 1992, and doubtless after the passing of the men who worked assisting him in creating the plates, inks, the press and printing the maps. Liberation day, 12th April 1945. My father’s 1:10,000 map of Oflag-79 overlaid on the present day site on Google satellite images. This week I received an e mail from Andreas Eberhard of Braunschweiger-Zeitung, the Brunswick newspaper, which was both greatly interested and greatly interesting. What was fascinating was to hear of the changing attitude of the town towards the camp and its history – “Did you know that the „Oflag 79‟ was sort of rediscovered by local historians in Braunschweig only a few years ago? For many years it was almost forgotten in the public memory of our town. From 2010 on, some research was done. Now there is a book and several newspaper articles about the camp. I will be happy to tell you about it. In my opinion the story of the „Brunswick Printers‟ will be of great interest for many of our readers”. I’m hoping to speak with Andreas Eberhard over the next week to put a piece together for the newspaper. Apart from it being very pleasing to receive interest from Brunswick/Braunschweig I found it emotionally resonant in some slanted way that this connection has been made 72 years after my father and his fellow prisoners left the camp and the town behind. Also this week, Jonathan Mounsey, the son of Harry Mounsey who was a fellow prisoner from Liverpool with my father, and who I met last week, sent me a Google satellite image of the current site of Oflag-79. In a moment of inspired idle curiosity I laid an image of The Brunswick Printer’s 1:10,000 map of the camp over the satellite photo and was astonished at how accurately it placed the roads and autobahn, areas of woodland and the bends of the River Schunter, all the major features. The Brunswick Printers 1:10,000 map of Oflag-79 fits over the centre left hand section of the Google satellite image where the cross roads is. Both these experiences have served to make the place more real and more tangible than I thought they might be; I have thought that there would be very little if anything left of Oflag-79, but what is more extraordinary is that a number of the buildings are still standing and still in use, currently as accommodation for refugees. An image of my father’s at the top, and an image of buildings on the same site today sent to me by Andreas Eberhard of Braunschweiger-Zeitung. Not touched upon yet on this blog is the Brunswick Boy’s Club in Bootle, now the Brunswick Youth and Community Centre. After the Allied bombing of the camp in August 1944 life became hard, the shower and kitchen blocks were badly damaged, drainage and sewage systems were partly destroyed, windows broken and power disrupted. From what I know from my father’s diary and other available information, life there until then had been reasonably bearable, but the winter of ’44-45 was cold and the war was moving into its final stages with German resources becoming scarce, with the obvious effect upon Allied POWs. Many of the POWs in Oflag-79, like my father, were officers who had known a degree of privilege and comfort before the war, and for most, after 2-3 and more years of imprisonment without an end in sight, these were the worst days. There was among some a realisation of what it was actually like to live without comfort and resources. A meeting was held in the camp, discussions were had, hands were raised and a decision was made that when, and if, they got home, a promise was made to start a series of boy’s clubs back in Britain. Money was raised in the camp via promisory notes, raffles, handshakes and through a Trust Deed drawn up in camp and over £13,000 pounds was raised in advance of liberation in April 1945. “At least one good thing shall come out of this miserable rotting period….. we will found a Boy’s Club for some of the many whose difficulties we now understand”. Article on the founding of the Brunswick Boy’s Clubs. (Source unknown). On return to Britain a committee was set up, and a national appeal started for more and better Boy’s Clubs, 10% of which was to go to the Brunswick organisation. Within a year, over £250,000 was raised. As far as I know, three Brunswick Boy’s Clubs were opened; in Liverpool, Glasgow and Fulham. All of them are still in existence. The Liverpool club, known as The Brunny, was founded and steered by my father, Philip Radcliffe-Evans and two fellow prisoners of Oflag-79, Harry Mounsey and Mike Marshall. When I was young I remember my father attending meetings and dealing with paperwork and being involved very much in the organisation, and as his business grew I know he stepped back, probably in the early 1960s. Mike Marshall and particularly Harry Mounsey continued their involvement until much later. Through working on The Brunswick Prison Camp Map Printers book I have reconnected with the now named Brunswick Youth & Community Centre in Bootle, Liverpool and was honoured and delighted to be asked to attend their 70th anniversary celebration day on 21st April 2017 and to say a few words. It has been through changes in both location and management since 1947, and now includes the Jamie Carragher Football Academy, is affiliated with a Tamil school, has links with the armed services and is closely integrated with everyone both young and old in the area; I know my father would have been greatly touched that it has gone from strength to strength and continues to be such a force for good in the community, and that it still carries the name “Brunswick” and that the reasons for its foundation are still so well remembered. A description from my father’s diary of the Allied bombing of Oflag79 in August 1944 which caused the prisoners to use tiles for plates out of necessity, which in turn led to his realisation that the tiles could be used as lithographic printing plates as explained in The Brunswick Prison Camp Map Printers…..
“…Our new room was less crowded and very much better – only 10 people – the old team. About this time I was stilling madly for Terence and Mike’s birthdays and made four bottles of raw alch(ohol). from raisin wine. Late in August we had the big raid which was one of the most horrifying experiences I have had. Wave after wave of bombers came over dropping HE (high explosive) and anti-personnel bombs – we were very lucky about 5 HE’s dropped in the camp (in the open as opposed to on buildings) and countless anti-personnel and incendiaries. None of our buildings caught fire as we put them out but the German admin block blazed as did nearly all their buildings. 3 people were killed including poor old Kilkelly and several goons (guards). I don’t know whether it was the caged in feeling or what, but I’ve never been so frightened before or after. Of course the camp was wrecked, windows shattered, drains completely finished, water off, steam for cooking off – nothing, nor have any of these things except drains (where the work was done by ourselves) have been completely repaired since then. It was this raid which made the coming winter so miserably cold. The camp was in a very bad state for weeks after this – nerves all to pieces and the constant “reds” (alerts) sending everyone to the shelters”.